And the questions that don’t. Basic questions are good questions. They matter. We learn from them. But there are stupid questions, or at least questions that don’t matter. These are questions people ask when there is little chance that they will learn something from the answer. 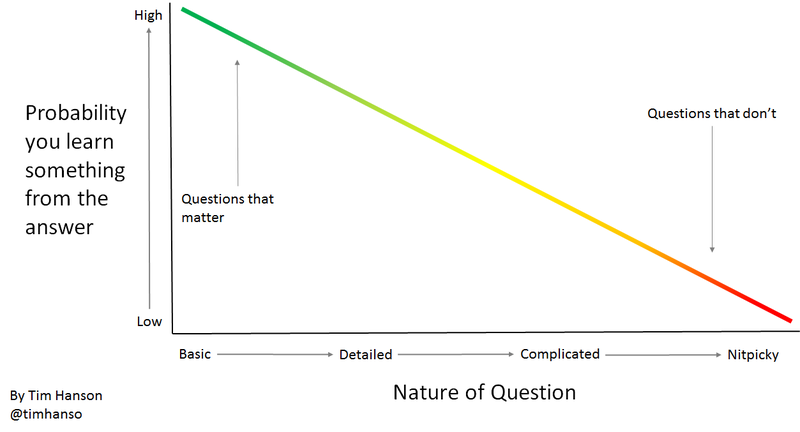 They include leading questions, preening questions, and statements disguised as questions. And while they can sound harmless, they prevent us from obtaining a better understanding of the world around us. That looks and sounds like an intelligent question. But why did I ask it? The answer, to the extent there is one, would be immaterial to my analysis. A 10-year discounted cash flow model with a terminal growth rate — or any other model for that matter — is not sensitive to such a short-term input. Instead, I asked it to justify my presence on the call. I asked it to demonstrate publicly just how quickly and completely I had dissected the company’s financial filings. And I asked it to prove how hard I was working. I did not ask it expecting to glean an insight that would lead to a better investing outcome. I didn’t set out to ask questions that didn’t matter, so where did I pick up the habit? From peers. From listening to other analysts. Asking those kinds of questions is a best practice in the financial industry. Complex, detailed, and fundamentally meaningless questions show off one’s apparent knowledge, obfuscate truths around keeping investing simple and low-cost, and enhance job security. I was wondering about on the net interest income side if you could talk a little bit about, Paul, what kind of outlook we should think about for the core net interest income… And you do get a day count help modest in the second quarter from the first 2, right? Doesn’t that help? It’s a leap year. So I think it’s normally down 2, but now it’s down 1 or flat, yes. The implication here that one extra day could have a meaningful impact on the long-term value of a bank with more than $2 trillion of assets is ludicrous. If your investing thesis hinges on some kind of leap-year effect, you are doing it wrong. But it was a sharp catch, and the question is asked and answered straight-faced on both sides. It’s hard to give you — to quantify this. I know we try all the time, but to tell you the truth, Robin, it’s sort of a waste of time for all of us…It’s the kind of super detail that seems to matter on these kinds of calls, but really amounts to nothing in the long run. Like my question about the cash conversion cycle, the answer to a question about market share over the next 90 days is not material to any rational analysis of Wynn’s long-term prospects. Wynn at that time was a company with an enterprise value of more than $20 billion and revenues of more than $5 billion and plans to open a massive new resort in Macau in just a few years time. But the analyst sounded on top of things — smart and observant with a keen eye for detail. Back in college I had a professor who cut off any question that began with the phrase “Don’t you think,” explaining that no real question could begin with that phrase. Rather, he said, lazy students — all of us, really — use this construct to disguise preconceived notions as questions . What’s more, these notions were usually ill-informed and a waste of time since we were barely more than teenagers. I tracked the number and merit of “Don’t you think” questions in my classes with less vigilant professors. Their occurrence was frequent and their quality poor. The repeat offenders were government classes where partisans pushed their own views as “Don’t you think” questions. But “Don’t you think” questions are dangerous everywhere because they are fueled by bias. Since bias is what you think before you consider evidence, bias is also a good way to lose money investing in stocks. This line of thinking crystallized for me when I read a a Wall Street Journal A-Hed about a 15-year-old Bank of America shareholder. This girl is a remarkable investor. What sets her apart from most of the rest of us is that she attends the bank’s annual meetings and votes her proxies. What’s more, she asks questions of management. Good questions. Tough questions. Short questions. Is that a naive question? Is it a stupid question? Let’s be honest: most of us professionals would not ask that question. On the one hand, that may be because it’s curt and confrontational, and we might be looking to curry some kind of favor or investment banking relationship with the company. On the other hand, perhaps we consider ourselves too enlightened to think that a stock price can accurately reflect the underlying value of a business. But whether you believe in the efficient market or not, the fact is that stock prices reflect business values some 99% of the time. So it’s a good question. If a management team is creating value, the stock — setting aside times of dislocation and overreaction — should mostly rise. Bank of America’s calls with professional analysts, however, are full of far less material questions. In addition to the leap year inquiry referenced above, here are some more gems from BofA’s first quarter 2016 call. I’ll focus my question on expenses, and then I’ll get back in the queue, but I think outside of incentive comp expenses generally were better than I was expecting, and how much of that is the Simplify and Improve? And how much more do you think there is to do on some of these core expenses, I guess, number one? This question doesn’t matter for a few reasons. First, since this analyst opens by forfeiting his right to a follow-up, bank management can pretty much say whatever they want and go unchallenged. Second, he invites them to celebrate their own branded cost savings programs. Third, he tells them the answer he wants to hear: that more savings are on the way. And in terms of March, what can you — just any color on what got better, what felt better, which areas of the business — could you help on that? This question doesn’t matter because the analyst is basically asking the bank why it was so awesome over a one month time period. Management may answer, but the answer is unlikely to be accurate unless they explain that it was due to chance. The analyst here is self-aware and admits this is a meaningless question before asking it, but plows ahead anyway. There is nothing significant about a $100 million expense given the bank’s $2 trillion balance sheet. Questions, like most things, are subject to the Pareto principle: 10% of what you ask will get you 90% or more of what you need to know. The rest is self-indulgence. As you can imagine, every time I asked a question like this, I learned that the company managed to free cash flow, that aggressive inventory management was a focus at all levels, and that the current stock price probably didn’t reflect the underlying long-term value of the business. They told me what I wanted to hear because I had told them what I wanted to hear. It was through a simple line of questioning like this that I learned a lot. For example, I learned that a certain Singaporean fast food chain was propping up its profit margins amid rising food costs by secretly shrinking portions — and that they thought this was a brilliant solution to their problem. But as a business-focused long-term investor, I was horrified. Not only were they risking their brand if customers caught on to the deception, but it wasn’t a sustainable approach. Should food costs continue to rise, the company couldn’t keep shrinking portions. What they needed was what they didn’t have — pricing power. It was an insight that changed how I analyzed and valued the company. But had I asked “Don’t you think portion-shrinking is devious and unsustainable?,” they would have agreed with me. Not only would I not have learned anything, I would have left with a distorted view of reality. First one, Lyndon, a high-level question. So looking at it over the last couple of years, there’s been a lot of moving parts. You guys want to retain assets. Now the focus is shifting a little, you are willing to sell maybe for price discovery of whatever it is, so you changed focus from growth to cost reduction. So my big picture first question is, what exactly is the business model of Solar City? And I have a couple of follow-ups. It’s a basic, important question. Why didn’t he ask it without all of those qualifiers? It’s one part that asking questions like this is hard and uncomfortable. It’s another part that analysts who ask tough questions aren’t allowed to participate in future conference calls. And it’s a third part that contributing to the theater of the stock market pays better than being a reality check. So it’s left to a 15-year-old girl from North Carolina to ask the questions that matter — she wants to learn something — while the rest of us, for one reason or another, ask the questions that don’t.